'Interview' co-stars James Franco and Rogan. 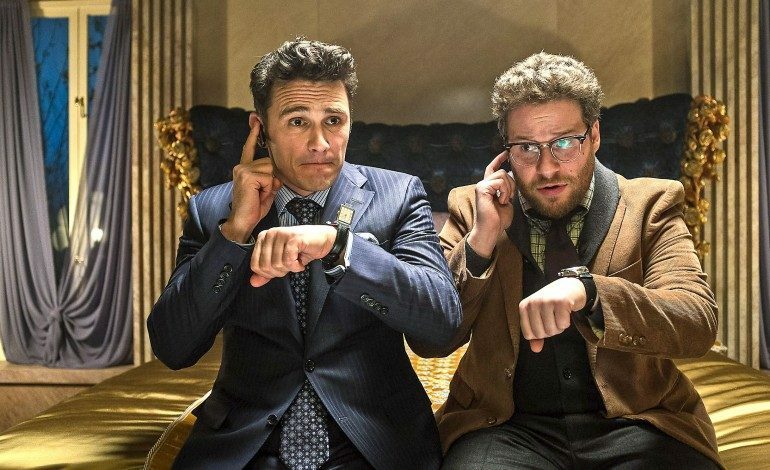 Those funny guys that brought The Interview to life (and helped revive it after death threats) are getting into the TV game. Seth Rogen will team with Interview writer Dan Sterling and co-director Evan Goldberg for a half-hour political comedy called Citizen Floyd. Fox bought the half-show with a put-pilot deal, which requires the network to air at least the pilot or pay steep penalties to the production company. Deadline describes the show as a workplace comedy with political, action, and suspense elements. What? After racking my brain to figure out another comedy that fits that description the closest I can get is some of the excellent theme episodes of Community. Action-comedy seems like an expensive proposition, the kind meant for big film budgets. We’ll have to see if these guys can translate their Interview humor to the confines of TV. If this doesn’t work out Rogen and Goldberg are also developing Preacher, an AMC drama based on the DC comic, starring Dominic Cooper. The show has already been picked up for 10 episodes. Sam Catlin, writer for Breaking Bad, helped pen the pilot. Rogan isn’t normally thought of as a producer but over his career he’s racked up a slew of successes in that role. He cut his teeth as a co-producer on The 40-Year-Old Virgin, followed by executive producer credits on Knocked Up, Superbad, The Guilt Trip, and more. For many of his recent projects like Neighbors, This is the End, and The Interview he’s taken a hands-on role, serving as producer. An executive producer oversees producers for either their own interests or for a company; oftentimes they’re the investors bringing the money to the project. In TV they can also be the creator/head writer for a show. A co-producer is one member of a team that is dividing and/or sharing the responsibilities of the producer. Actors who want to produce or direct often team with a producing partner, which seems to be the relationship between Rogen and his childhood friend Evan Goldberg. The two have worked together on nearly every project since 2007’s Knocked Up. At this point Rogen has acted in more than 70 projects, written 18, and directed 3; he’s basically working himself toward mogul status. Dan Sterling brings a long history in TV to the table, having written for South Park, Jesse, King of The Hill, and The Sarah Silverman Program. He’s served as producer for Kitchen Confidential, The Daily Show, and Girls, among others. No word yet on what role he’ll fill on the new comedy. Rogen will appear next in The Night Before, a Christmas comedy releasing November 20th.